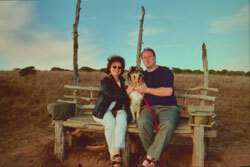 Toby was our first Australian Shepherd. We brought him home on Easter Sunday 2002. He was an adorable and loveable puppy, our precious little 'boy'. We loved him from the first moment we held him in our arms and looked into his face. He was the only blue merle male out of a litter of ten. The future seemed bright and full of promise. He developed normally as he grew and played. He was the smartest dog we had ever had. Just one week after coming home he was learning tricks. It usually only took him a few minutes to understand what we wanted and to do it. At 12 weeks old he loved to fetch the ball. At 7 months old he loved to swim and frolic on the beach. At 10 months old, while on a trip with 'mom' to the post office, he suddenly and without warning began jerking, twisting, and turning motions. He was unable to stop, he couldn't sit still, and he couldn't be held. He kept jerking his head while darting back and forth. These episodes continued intermittently for 2 ' months. In spite of numerous trips to the hospital and extensive blood tests, they went undiagnosed. No one could figure out what was wrong with him. We would later come to understand that these were "partial seizures". 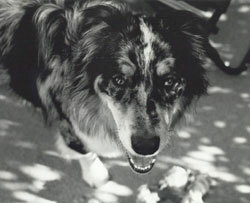 We celebrated Toby's first birthday on February 17, 2003 hoping that whatever was wrong with him would somehow disappear. On March 23, 2003, one month after his first birthday Toby, our precious little boy, had his first Grand Mal seizure. That would be the first of many. A neurologist ran more tests, including a spinal tap and an MRI. All tests were normal and no underlying cause for the seizures could be found. The diagnosis was Idiopathic (primary) Epilepsy. Toby has had numerous seizures, including cluster seizures, and made many trips to the emergency room. He has regular appointments with a neurologist, as well as monthly and quarterly tests, depending on how he is doing, to check his medication blood levels. He is on Phenobarbital and was taking Potassium Bromide until a bout with pancreatitis resulted in him being taken off of it. We also give him nutritional supplements and have made changes to his diet. After daily and weekly seizing, we were fortunate to achieve an 8-month period that was seizure free. That time with him was wonderful. He was playful and happy. On the morning of May 25, 2004, this cruel disease broke through with a vengeance and Toby started cluster seizing. The disease has progressed and the drugs are taking their toll on him. Toby's future is uncertain and precarious. Toby is now 4 1/2 years old and at present is doing well. We remember when we did not even think he would make it to his second birthday since problems began showing up in him at 10 1/2 months old. He is currently taking Phenobarbital, Potassium Bromide and Keppra 3x a day. Even with these medications he usually seizes once every 7 - 12 days. This has always been rather typical of his seizure activity in spite of the many things we have tried over the last 3 1/2 years. We feel fortunate that when the seizure and post ictal period are over he returns to his old self. Of course, there have been rough spots along the way but again we feel fortunate to have gotten through them. His most troubling difficulty this past year has been the ataxia- the weakness in his hind legs- as a result of the Phenobarbital and/or the Potassium Bromide. The ataxia and the frequency of his seizures has made him more vulnerable to injury. 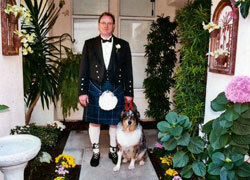 He suffered a torn ACL in his right rear leg in 2005 and had to have ACL surgery last Christmas. The pros and cons of surgery as well as the type of method used had to be carefully considered due to his condition. He did recover very well from the surgery and healed up nicely. He now has a partial tear in his other rear leg which we are hoping will heal up without the need for surgery. Recently, we have had the opportunity to give Toby some swim therapy and that has proved to be a tremendous blessing and help for him. He can get the exercise he needs without the stress and strain on his legs that happens with walking and running. Swimming is a good low impact exercise. We now see a good improvement in his rear legs in spite of the ataxia and the frequency of his seizures. 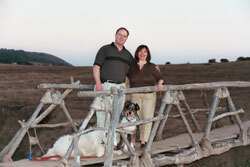 As every owner of an epi dog knows it is a journey we take day to day with our beloved epis. We do the best we can and hope for the best! Toby's Foundation is working for the day when the researchers will have all they need to find the gene marker so a screening test can be developed to stop this cruel disease. While it won't help Toby and all the others afflicted with this disease it will save others from this terrible and life threatening disease and the tremendous toll it takes on not only the dog but the people who love them! Toby died on November 19, 2009. He had to be euthanized due to the disease and its complications. Please see the Memorial/Tribute page.